It's the witching hour! New designs boast the best of Halloween, and are spooktacular additions to pillows, apparel, holiday decor, and so much more! 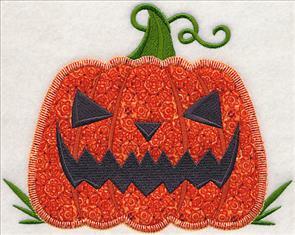 New heirloom applique features classic October 31 motifs, while Halloween lace adds a boo-tiful look to your decor. 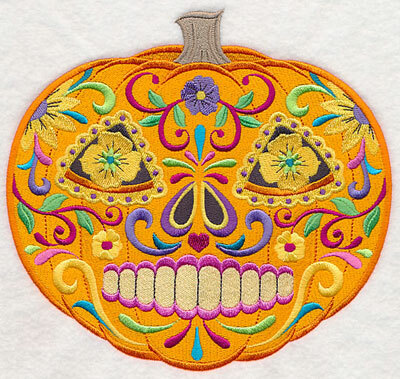 Stitch a de-frightful wreath on a yard flag, or update your trick-or-treat tote with a sugar skull pumpkin. 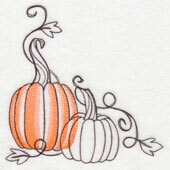 Plus, in-the-hoop door hangers, toile pumpkin designs, cute apothecary labels, and more! Order these fang-tastic designs today! 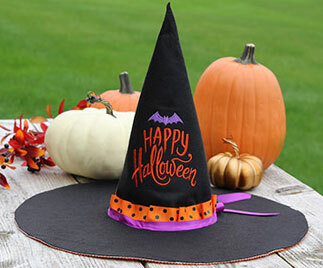 hat with this project tutorial. 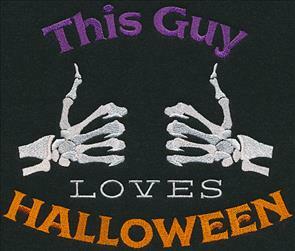 Find the Halloween design here. 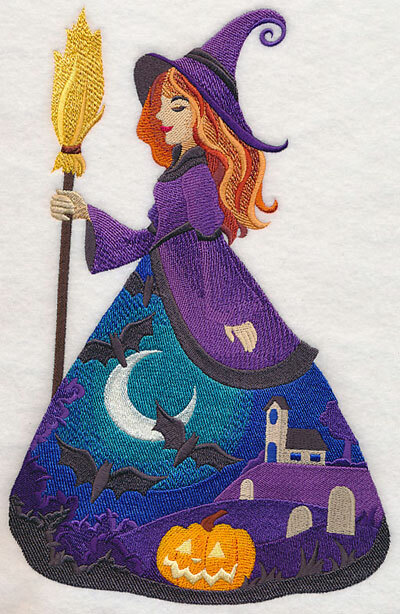 Bewitch friends and family with a scene depicting Halloween inside the dress of a charming witch. 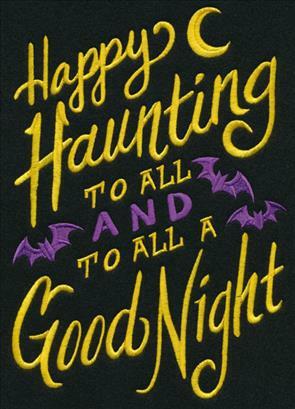 Bats, a jack-o-lantern, and gravestones mark the classic nighttime landscape of October 31. 6.90" x 10.73" and 5.85" x 9.10" and 5.01" x 7.80" and 4.41" x 6.86"
Even these sugar skulls are dressed to the nines for the festivities on fright night. 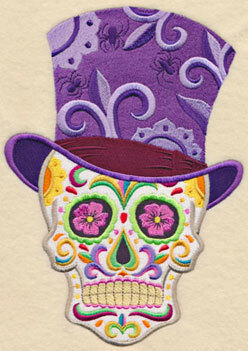 A witch's hat and top hat give these traditional Day of the Dead motifs a classic Halloween look. 5.53" x 7.77" and 4.89" x 6.87" and 4.12" x 5.79"
Here, a pumpkin gets the sugar skull treatment with decorative swirls and flowers. Great for a trick-or-treat bag, wall hanging, or pillow! 7.37" x 6.90" and 6.25" x 5.85" and 5.18" x 4.85"
Light sketching and toile transform this pumpkin patch into a Halloween delight that will last all autumn long. 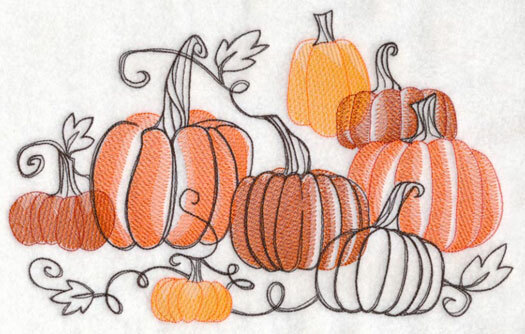 Stitch on a project at the beginning of October and display it in your home all the way through Thanksgiving! 11.03" x 6.88" and 9.38" x 5.85" and 7.78" x 4.85" and 6.85" x 4.27" and 3.85" x 2.40"
A simple pillow is the perfect place to let this design shine. 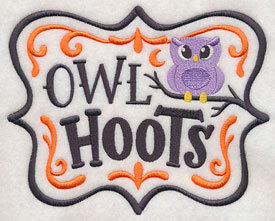 The light stitching and open areas are excellent for stitching on solid-color, low-nap fabrics such as canvas, twill, quilter's cotton, or denim. 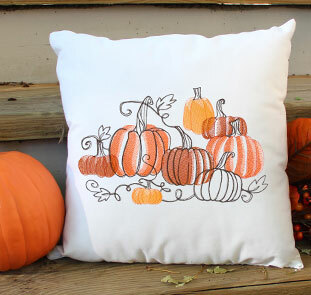 The variety of colors used in these pumpkin designs feature the distinct hues of the season. Stitch this border and corner on bedding, table linens, or tea towels! 11.72" x 3.79" and 9.38" x 3.03"
7.78" x 2.52" and 6.00" x 2.19"
Spooky one-color wreaths boast nature's de-fright-ful side. 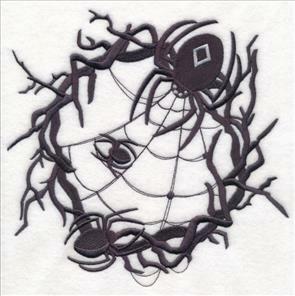 Branches with bats, spiders, and crows make up the circular motifs. 7.54" x 7.81" and 6.90" x 7.15"
5.86" x 6.07" and 4.88" x 5.06"
Stitch the fang-tastic designs on pillows, quilts, garden flags, and more to share your Halloween spirit. 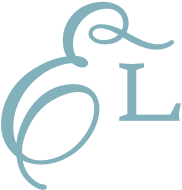 7.77" x 7.80" and 6.90" x 6.92" and 5.85" x 5.87" and 4.86" x 4.88" and 3.84" x 3.85"
Framed artwork, door hangers, totes, and more are the perfect place to spread these words of Halloween wonder. 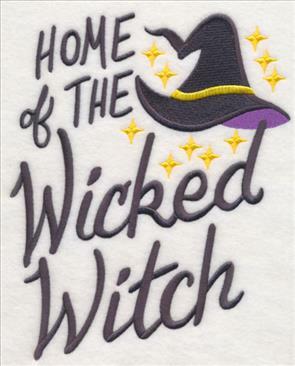 Stitch "Home of the Wicked Witch" on pillows and dish towels to mark your territory; "Trick or Treat" is a terrific addition to totes for Halloween night. 6.86" x 9.03" and 5.86" x 7.71"
6.87" x 9.47" and 5.67" x 7.82"
4.87" x 6.71" and 2.81" x 3.87"
Sweatshirts, outdoor decorations, and more will get a frightfully charming update with these fun designs. A great way to get ready for the spookiest holiday of the year! 6.87" x 9.59" and 5.60" x 7.82"
6.00" x 11.75" and 4.81" x 9.40"
3.99" x 7.81" and 3.51" x 6.85"
Too-cute-to-spook labels featuring "bat breath" and "owl hoots" are sweet additions to tea towels, wraps for kitchen containers, aprons, and more. 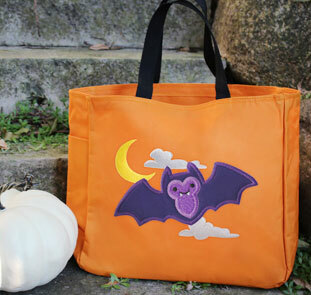 Use to add a haunting tote to your kitchen or party decor! 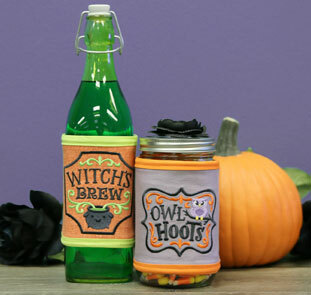 7.42" x 5.86" and 6.15" x 4.86" and 3.86" x 3.05"
Create fabric wraps bearing these adorable apothecary labels to decorate jars filled with candy, party favors, or treats for trick-or-treaters on All Hallow's Eve. See how to make these fabric jar wraps in this project tutorial. 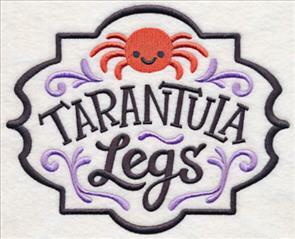 A jar full of spider rings is the perfect place to showcase this "tarantula legs" design! 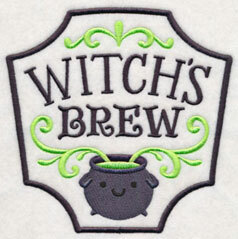 Add the "witch's brew" motif to wine bottle wraps, bags, or fun cocktail napkins. 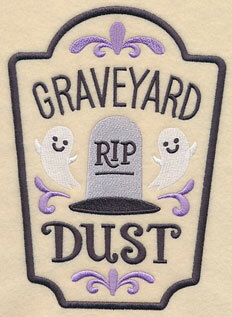 5.87" x 5.86" and 4.87" x 4.86" and 3.87" x 3.87"
"Toadstool clippings" and "graveyard dust" finish off this collection of sweet-yet-spooky Halloween labels. Pick your favorites, or stitch them all! 5.86" x 8.11" and 4.86" x 6.72" and 2.81" x 3.87"
These sweet labels are perfect for parties, home decor, and more. Purchase the designs individually using the links above, or get them all in a design pack. 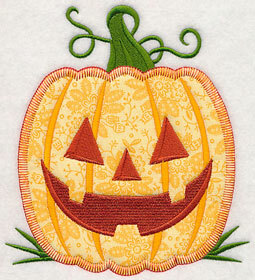 Cute little spooks in heirloom applique will bring classic Halloween style to your embroidery. Here, two different types of jack-o-lantern faces (one friendly, one spooky-scary) are ready to shine on trick-or-treat bags, quilts, and more. 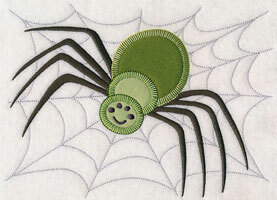 See how to stitch heirloom applique designs here. 7.45" x 5.84" and 6.18" x 4.86" and 3.87" x 3.05"
Some of these designs have multiple pieces of fabric for an eye-catching look. 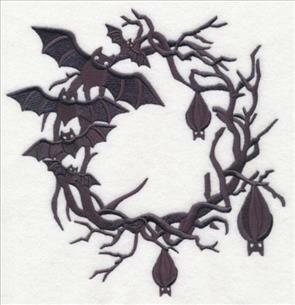 The bat and spider below are excellent examples of this type of applique. 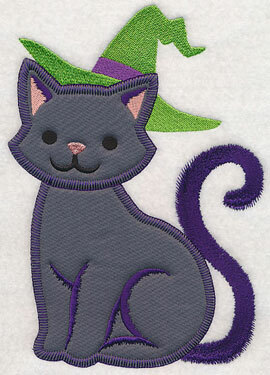 Get project instructions for multi-piece applique here. 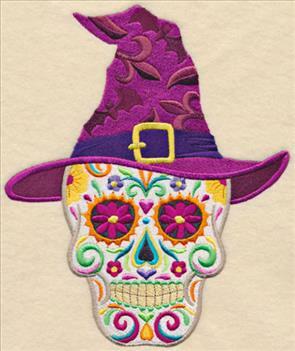 7.80" x 5.74" and 6.59" x 4.84" and 3.85" x 2.86"
Trick-or-treat bags, costumes, decor items, and more will get a stunning new look with these positively de-frightful applique designs. 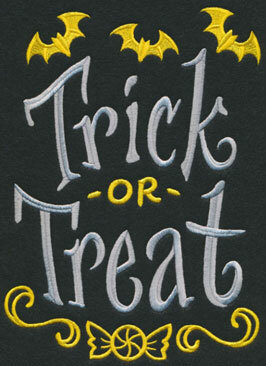 Get even more ideas for Halloween projects and designs in our new Lookbook here. Happy haunting to you and yours with these black cat and ghost designs! 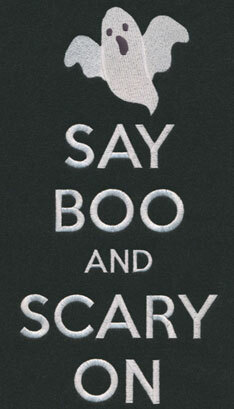 Both use just one piece of fabric to create a classic Halloween look. 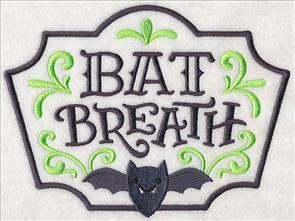 See the instructions for heirloom applique designs here. 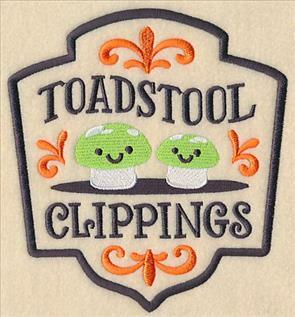 5.86" x 7.61" and 4.84" x 6.28" and 2.98" x 3.86"
Bring the boo crew to your next embroidery project with these heirloom applique designs! Purchase them individually using the links above, or get them all in a design pack. 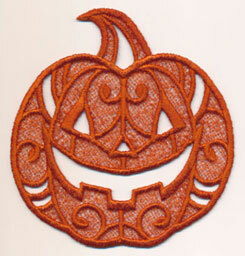 Beautiful freestanding lace gets an unexpectedly spooky makeover with these new designs! 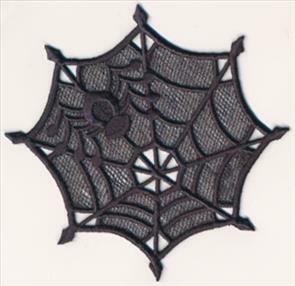 Five different Halloween shapes -- a black cat, jack-o-lantern, spider web, ghost, and bat -- are perfect for adding to your holiday decor. 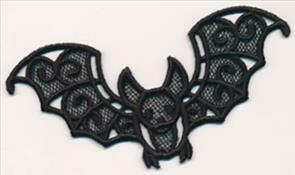 4.86" x 5.03" and 3.75" x 3.88" and 2.93" x 3.03"
Each of the lace designs are in classic Halloween shapes, but inner details and accents add an extra-special touch. 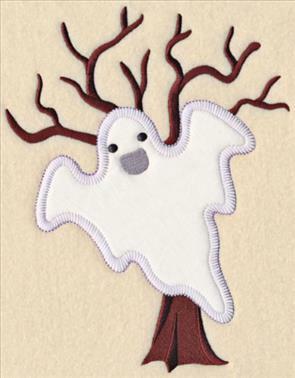 Slip in a card, add to a wreath, or display in your home for a spooktacular look. 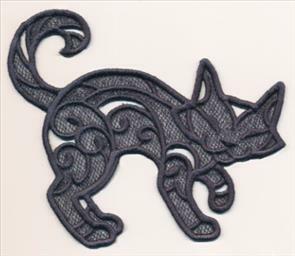 See how to embroider freestanding lace here. 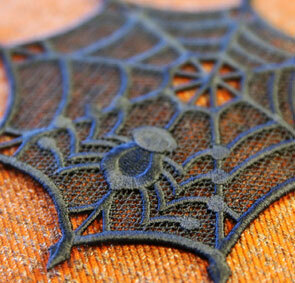 4.99" x 4.87" and 3.88" x 3.79" and 3.03" x 2.96"
A spooky spider hides in his web in this freestanding lace design. 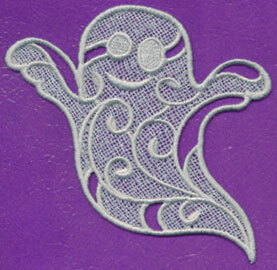 Stitch these lace motifs in the colors shown here, or experiment with metallic, variegated, or brilliantly hued threads for a unique look. Match to party decor, or a decorating scheme! 5.01" x 3.09" and 3.86" x 2.38" and 3.03" x 1.87"
We love Halloween! 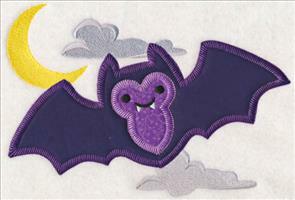 Share your fondness for the frightful night with these fun designs. 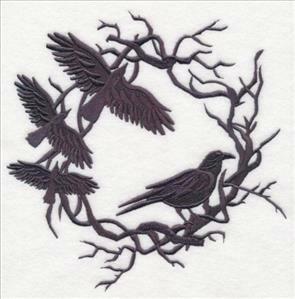 Perfect for apparel, this motif comes in ten different variations (one for everyone in the family. 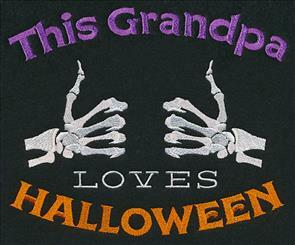 7.80" x 6.38" and 7.14" x 5.85" and 5.90" x 4.84"
Add this fun design to T-shirts and sweatshirts to wear on October 31. 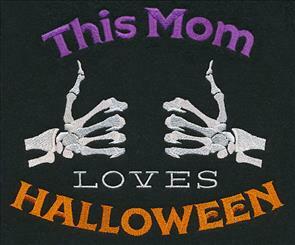 Great for taking the kids trick-or-treating, or wearing to a holiday party! Get our tips for stitching on T-shirts here, and sweatshirts here. 7.82" x 6.39" and 7.16" x 5.85" and 5.91" x 4.83"
7.83" x 6.14" and 7.11" x 5.59" and 6.14" x 4.82"
7.80" x 6.32" and 7.10" x 5.75" and 5.94" x 4.82"
7.80" x 6.47" and 7.02" x 5.83" and 5.82" x 4.84"
Welcome trick-or-treaters to your front door with a friendly vampire "velcome" (or "welcome"!). 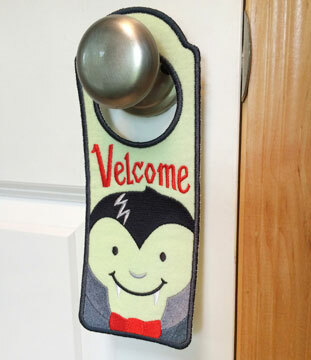 This door hanger design is constructed entirely in-the-hoop, and is a fun project for Halloween. See how to make this in-the-hoop design by following the instructions in this project tutorial. 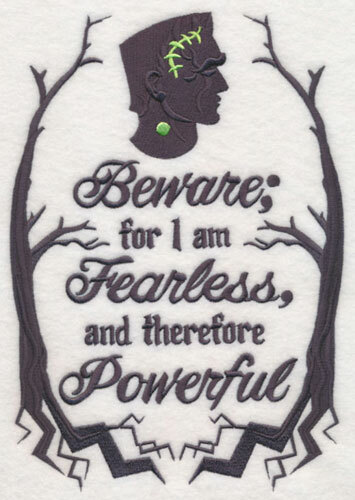 3.71" x 9.40" and 2.71" x 6.87"
Marie requested a design featuring Mary Shelley's Frankenstein, and it's the perfect motif to share for Halloween. Stitch the inspiring quote on pillows, totes, and wall hangings. 6.91" x 9.81" and 5.50" x 7.80" and 4.83" x 6.85"